And that’s exactly how I feel when ever I am served real good Thai food. I like everything about Thai cuisine; the ingredients used, its flavour, the way it’s cooked, the fresh herbs and aromatic spices and above all the way it tastes. And another reason for my love affair with Thai food is the use of coconut in most of the recipes. A typical Mangalorean girl that I am, my heart skips a beat and makes me do cartwheels in air whenever I find this favourite ingredient of mine in any recipe. Since the day we have had come back from our India trip, we haven’t been cooking anything elaborate in our tiny kitchen. Although we would like to blame our mothers for spoiling us by not letting us cook in their kitchen, it was plain laziness that has kept us away from pots and pans. All these days we have been satisfying ourselves with soups and breads and simple dal/rasam and rice. But it didn’t take much longer for stomachs to start grumbling for something exotic and our taste buds to crave for something packed with flavours. With typical cold and grey winter days and sun god gone missing for days together we were left with no choice but to create this sunshine in a bowl to lift our mood and spirit. We chose to cook this delicious bowl of Thai Yellow Curry and served it with fragrant Thai Jasmine Rice which resembled the snow flakes that had turned our neck of woods into snow kingdom. 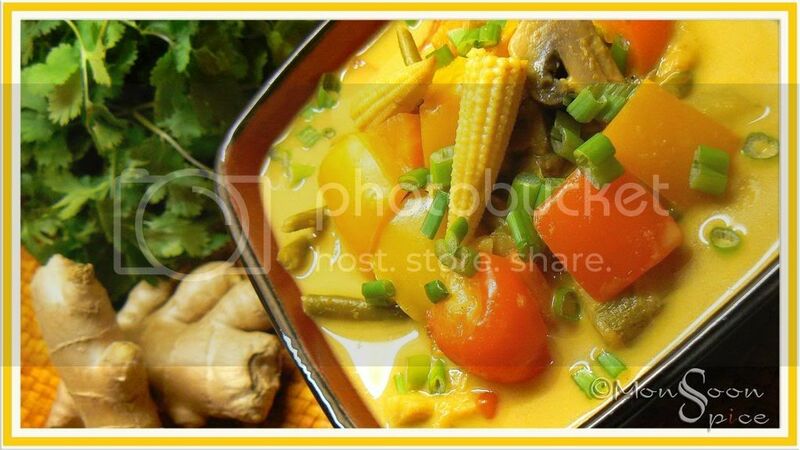 The colourful and delightful vegetables cooked in creamy and sweet coconut milk and flavoursome curry paste made using freshest of herbs and spices is sure to bowled any foodie’s heart and soul. 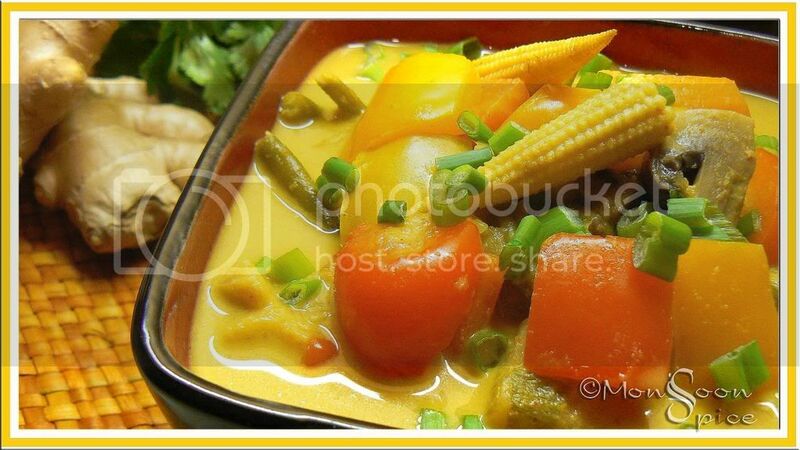 Thai Yellow Curry is my entry for AWED-Thai event hosted by dear DK at Culinary Bazaar. Heat a pan and dry roast coriander seeds, cumin seeds and pepper on slow flame till they change colour and are aromatic, about 2 minutes. Transfer them to clean bowl and let them cool completely. With a help of coffee grinder or mortar and pestle grind them to fine powder. Add this powder to all the ingredients listed above and grind them to smooth paste adding little water at time. Make sure that you add water only when it is required to get fairly thick and smooth paste. You can store this paste in an air tight container and refrigerate for upto one month and use as and when needed. Now add 2-3 tbsp of Yellow Curry Paste and stir well. Keep stirring for 2-3 minutes till the curry paste blends well with the coconut milk and its raw smell disappears. Add the vegetables and spring onions to it and mix them well so that each piece is coated with coconut and curry paste mixture. Mix in vegetable stock or water, remaining coconut milk, Soya sauce, kaffir lime leaves if using, brown sugar and salt to taste. Cover and cook for 5 minutes. Open the lid and adjust the seasonings. Simmer the heat and let it cook uncovered for another 5 minutes till the vegetables are cooked to tender. Make sure that the vegetables are not overcooked and retain their crunch. Am I getting luckier today..?First it was a Thai salad at Asha's and now this...I'm delighted.Have always seen only non-veg Thai dishes and I had lost hope of making/tasting Thai food..great great recipe!! I haven't tried thai curry though I have a book with quite a few Thai recipes. Yours looks delicious, Sia! Wow Sia, it looks divine. We love Thai food too and the weather is perfectly miserable for it right now. Thanks! Wow and wow.I too have strted liking Thai.I tried the greencurry and used the paste with noodles as well.Never tried yellow.Looks comforting and delish. Woow beautiful and delicious looks veg tahi curry. I have only made thai green chicken and that was ages and ages ago. Send it to AWED, theme is Thai this month. love thai food, i can have it everyday(i think so!!!!!). 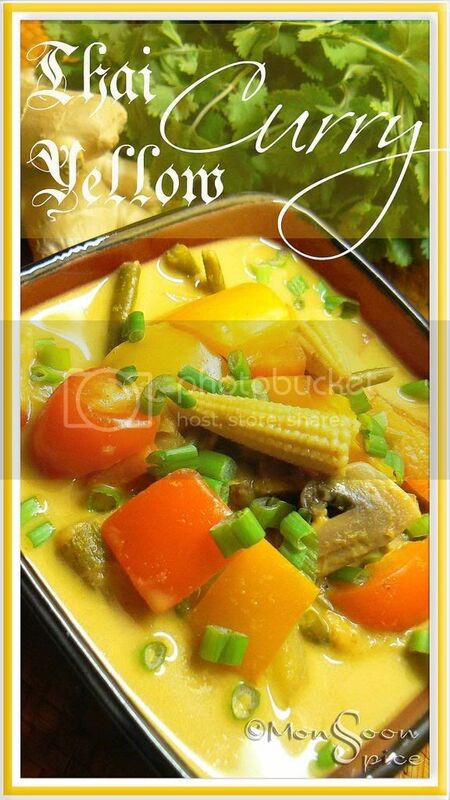 this yellow curry looks yummy. I never tasted thai food before! You're tempting me with your words and description! mmm. the curry looks so mouth-watering! Stunning pics as always! Have a great weekend. I make it just like this :) In fact, the same stuff too! Wow really a comforting and warm recipe.. 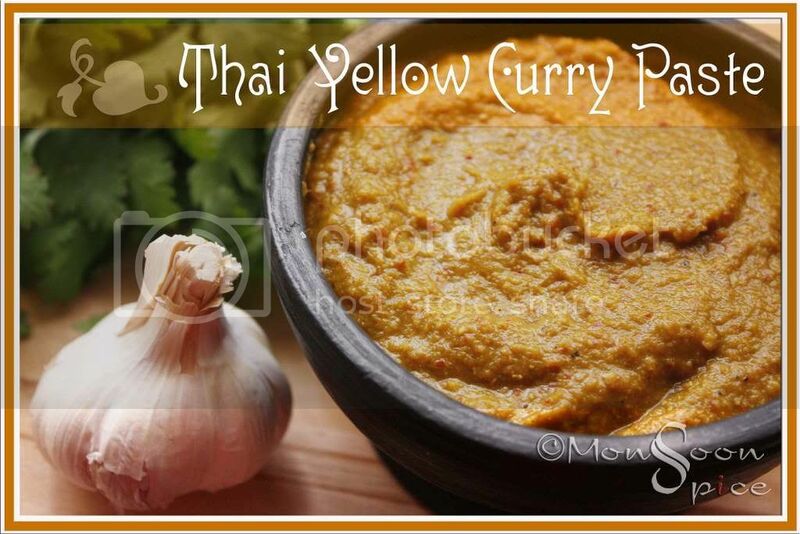 Perfect for the season.. Love the spicy flavour of thai paste..
Wow Sia.. love thai foods...Looks yummy an mouth watering..Perfect fot this cold weather.. Happy New year to you Sia. Have never tried Yellow curry before Sia....looks delish. I usually make a stir fry version of the alu-capsicum. Will be trying out your curry version. I hope you had a wonderful Sankranti!